I once wrote a quick note about Vala and Vim (or Vim and Vala) and the use of the Tag List plugin. Here is a clean post about these two beasts. Vim — probably the best editor out there, at least always after trying out different editors I end up with Vim — has great plugins. However there is a lack of support for the Vala language. 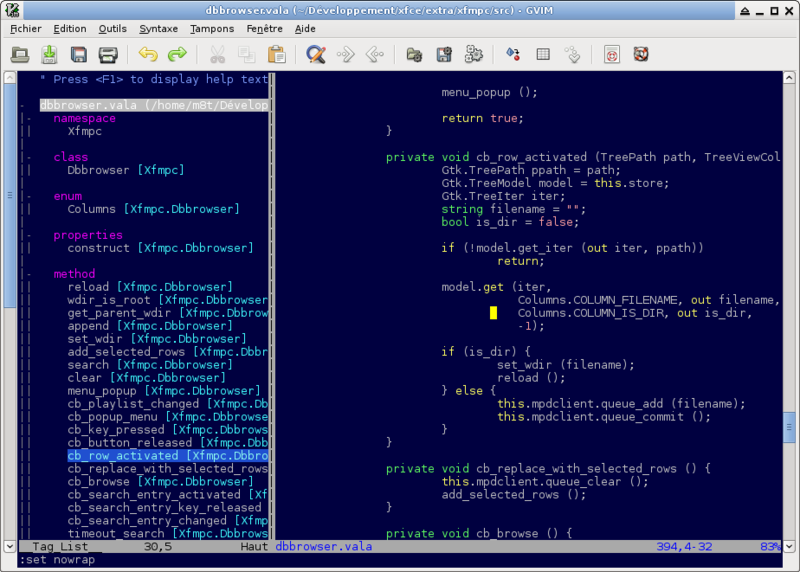 So here are two basic add-ins to include in the Vim editor. First there is no syntax color for this language. A quick fix is to use the C# syntax with the command :set filetype=cs. That works but is not ideal, ideal is to install a vala.syntax file, and there is one available on this GNOME Live! page. Tag List is a powerful plugin that lets you explore classes or functions from a source file, also called a source code browser. The installation steps are simple, they are also available bellow, and again to get it working with Vala there is a small hack to include inside the ~/.vimrc file. Now Vim is ready for Vala, and it's possible to browse source code by typing the command :TlistToggle. 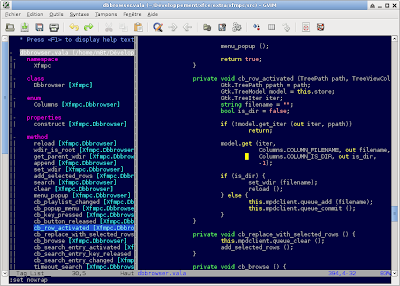 I hope there will be no vala deps in xfce! http://majutsushi.github.com/tagbar/ is better and still developed these days, you might think about switching over, it's pretty seemless.